Analoger Fotostammstisch #15: DDR-Wanderkino • analogueNOW! After the long break is analogueNOW!’s Analoger Fotostammtisch finally back! Let’s got the movies! Come with us to experience the uniqueness of a Wanderkino from the GDR! True film on a true 35mm copy, for a truly analogue evening! What is the “Analoger Foto-Stammtisch”? 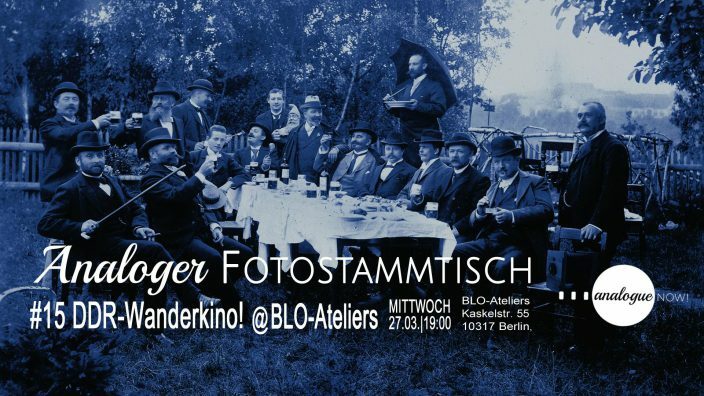 “Analoger Foto-Stammtisch” is a meet-up for analogue photographers and interested people. Are you fascinated by analogue photography, do you want to learn more about it and would like to connect with other analogue photography lovers? – “Analoger Foto-Stammtisch” makes it possible! With changing topics and activities such as show&tells, photo walks, workshops, visits to photography exhibitions, lectures and presentation, “Analoger Fotostammtisch” is dedicated to everything on analogue photography. Organized by analogueNOW! – the festival of analogue photography in Berlin – a new space of exchange for analogue photography enthusiasts in Berlin will be created, where they can meet like-minded people, exchange ideas and thereby build a network of analogue photography lovers, photographers and other sympathizers. Every analogue lover, photographer and every interested is warmly invited! “Analoger Foto-Stammtisch” is held once a month. Admission based on a small donation.